Bullies and charlatans are everywhere these days. You can find them on the playgrounds, the internet, and even in your own home. They push you around, tell you fictional stories that never really happened, and believe in their lies like they are the God-given truth. Nowhere is this more prevalent than in a conventional doctor’s office during flu season. But you have wised up, right? You’re not playing their “do as you’re told” game, because you have educated yourself enough to ask intelligent questions and are brave enough to confront your doctor on the subject, even if it makes your knees shake. After all, it’s YOU that has to deal with the potential repercussions, whereas the doctor just walks away with more dirty money lining his pocket, while claiming ignorance to any potential injury you may sustain. 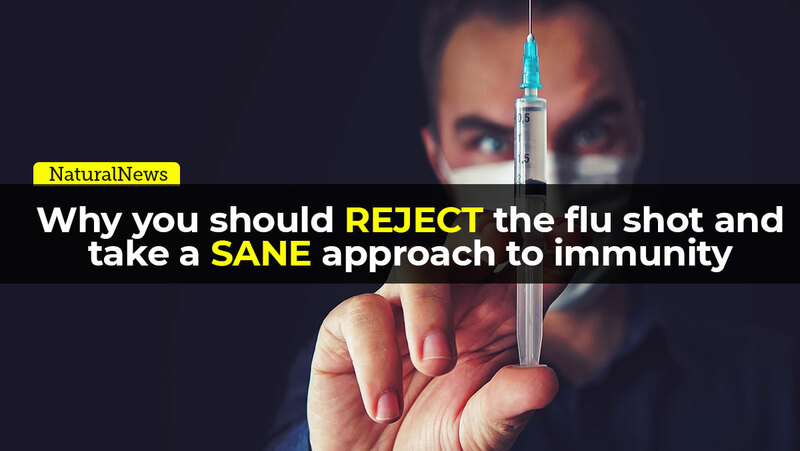 However, in case you’re still not sure if you should reject the flu shot, consider these three reasons why you should, along with some bonafide ways to improve immunity and get over the flu, naturally. 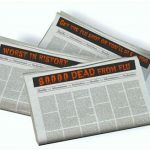 Is your fear of the flu, or your doctor, still enough to make you ignore these warnings on the product itself? 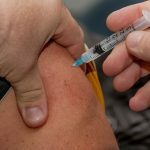 If you’re still thinking about it, consider that the U.S. Centers for Disease Control and Prevention, which gauges the vaccine’s protective ability, has found that the flu vaccine reduces risk of flu by 40-60 percent when it is used during seasons where the circulating virus is well matched to flu vaccine. In other words, IF they GUESS the strain correctly, you still only have a median 50-50 chance of being protected from the flu. 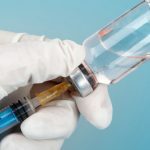 Results from last flu season show that between November 2, 2017 and February 3, 2018, the flu shot was estimated to be 36 percent effective overall, with the dominant virulent strain circulating that season (H3N2) about 25 percent effective. This was actually better than experts feared, with trends in Canada and Australia reported to be only 10 percent effective. The shot was reported to work 67 percent of the time against the less severe H1N1. Good to know that it is least effective against the more dangerous strains, and more effective against the ones we should be less worried about. Again, you don’t have to really guess what is in the flu vaccine if you are able to read the actual insert. 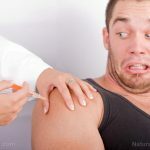 Along with some other questionable ingredients, the flu shot has been documented to contain aluminum, antibiotics, egg protein, formaldehyde, monosodium glutamate (MSG), and thimerosal, a mercury containing chemical compound. 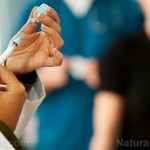 Being injected (bypassing many detoxification pathways) with any of these ingredients is horrid, but thimerosal is indeed the worst, with half of its makeup being mercury. So in the case of Flulaval, each 0.5 ml dose contains 50 mcg of thimerosal, or approximately 25 mcg of mercury. Given mercury is one of the most dangerous toxins to the human body on the planet, this is VERY concerning. This makes mercury in tuna laughable in comparison, with 250 ppb typically found in this fish. That makes the flu shot 100 times more dangerous, and arguably more traumatic since you are presumably not injecting tuna directly into your bloodstream for lunch. More transparency on the Flulaval vaccine insert shows a list of side effects reported by actual users. Are these worth risking, for a 50-50 chance you might avoid the flu? And that is the short list! How could anyone classify “medicine” as something that would cause these types of symptoms? For more information on the side effects of vaccines, visit Immunization.news. Perhaps you don’t know of the risk-free, tried and true, lifestyle habits that create REAL immunity from biological warfare. Things like avoiding sugar, alcohol, dairy, and gluten, and taking in pure water, clean produce, vitamin C, vitamin D, medicinal mushrooms, and probiotics. This is just a short list but for more details on what works well for building the immune system, read 7 Ways To Strengthen Your Immune System Naturally. 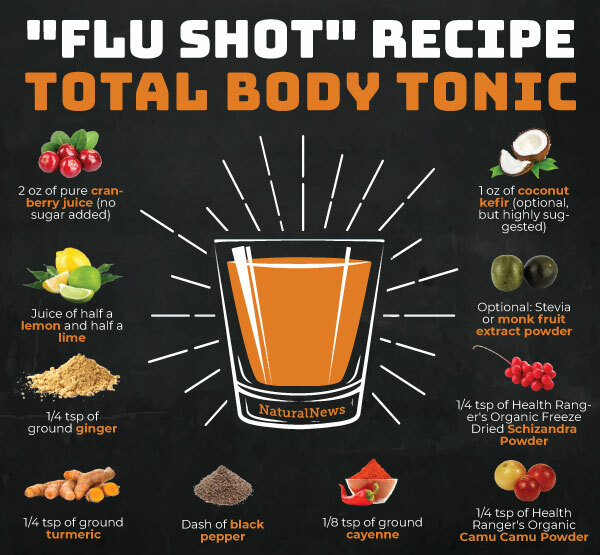 You can also create a daily “flu shot” that is sure to support your immune system, which I call the Total Body Tonic. Simply mix together all the ingredients below, and put it down the hatch (for best results, use suggested products)! Two critical components of this drink are the synergistic and powerful blend of the Health Ranger Organic Camu Camu Powder and the Health Ranger Organic Freeze Dried Schizandra Powder. Together, their purity and potency make this drink a no-brainer for immune system support. 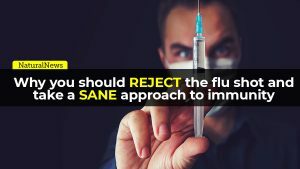 Now don’t you feel better that you can enjoy good food and drink, and not be poked with a toxic needle, to master your immunity this flu season? I know you do. You’re welcome.